Oh how I love fall! It is nowhere near fall temps here in Phoenix, but I so am craving that chilly fall air. I don't know if it is because I am a fall baby, my birthday is one week prior to Halloween, or just because I'm getting less patient with my native state's brutal summers-which we have just endured one of the worst on record! Whatever it is about fall that thrills me, I love it and embrace it. 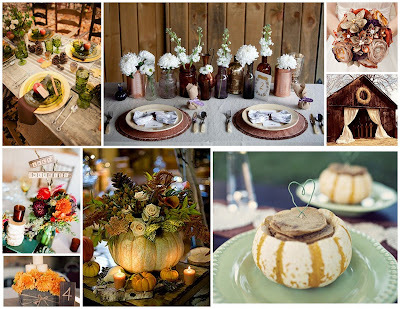 I wanted to create a fall wedding themed inspiration board, because there is much loveliness out there to incorporate into a fall time wedding. The theme seen here has more of a rustic twist to it, which I feel really brings out the beauty of fall found in nature. I love the use of the white pumpkin as a centerpiece, filled with gorgeous flowers and greenery, surrounded by gourds and candles. The image with the various bottles filled with simple stems shows an excellent way to bring in hues of brown to the setting. Linens don't have to be brown, natural elements can be incorporated to add in those touches, and that table setting is a great example. Likewise including pine cones adds simple decor. Of course I love the barn for a fall reception! It does bode much opportunity of implementing those sweet rustic touches that can be quite elegant. Whatever inspires you for your wedding, have fun, and look beyond linens to create your color palette.